As a responsible business, we have an obligation to preserve and protect the environment and to give back and support the communities in which we operate. Together with BioPak we donate our time, energy and 7.5% of all profits to environmental restoration initiatives and community programs that contribute to the welfare of less fortunate individuals, and help accelerate the transition to a circular economy by promoting sustainability, economic development and self-sufficiency. Thanks to all BioPak and Abel-Pakk customers, we have contributed to the planting of 5,000 trees and the purchase of three hectares of threatened Daintree rainforest in North Queensland since 2011. All BioPak products are certified carbon neutral. The carbon emissions associated with the production, transport and disposal of our products are measured by the Carbon Reduction Institute and offset through the purchase of carbon credits. We are inspired by the community work of so many of our hospitality customers, particularly those working with the homeless and disadvantaged. A percentage of sales of our Indigenous BioCups go directly to CorporateConnect.AB to support Indigenous communities by developing practical, innovative and sustainable solutions for employment and economic advancement. We also support the BioCup Art Series to promote artists whose work raises awareness and reconnects consumers with the environment. STREAT – stop homelessness the delicious way – running 3 cafes and coffee carts, roasting their own coffee and producing cookbooks, to support and train young homeless people find employment in the hospitality industry. We proudly donate BioCups. We have been supporting Rainforest Rescue's restoration and native forest buy-back projects and their Save the Cassowary campaigns since 2012. In 2015 we have increased our commitment to conservation and will donate 1% of our profits. The Final Step Cafe, Melbourne, is becoming a social enterprise with all profits going towards projects aimed at impoverished communities in South America. These projects will be facilitated by Social Opportunity Group. We are donating BioCups to help. BioPak donate takeaway containers to Christ Mission Possible who serve up 700 meals and gives away 1,500 food hampers a week to those in need throughout a footprint stretching from Blacktown to Springwood in Sydney's west. Rosies simply aims to acknowledge human dignity and inspire an increased self-reliance over a cup of soup and coffee. BioPak donate 100,000 BioCups/year to Rosies have a cuppa program. Foodbank is a not-for-profit non-denominational organisation that supplies food relief to 300 agencies and 180 school breakfast programs. They are recognised as the largest hunger relief organisation in QLD and help feed over 16,000 people every day. We donate cups to refresh participants of The Women in Super Mother’s Day Classic – an annual fun run and walk that provides the community with a great way to celebrate Mother’s Day and raise funds for breast cancer research. We regularly donate products, money and time to the great people at OzHarvest. OzHarvest is the first perishable food rescue organisation in Australia collecting quality excess food and delivering it, free of charge, to 600 charities. Started by one man in 2009 to raise awareness of depression, developed into a national suicide prevention charity involving thousands of motorcycle riders who've raised over $2,000,000 for mental health services. We donate BioCups to keep them going. 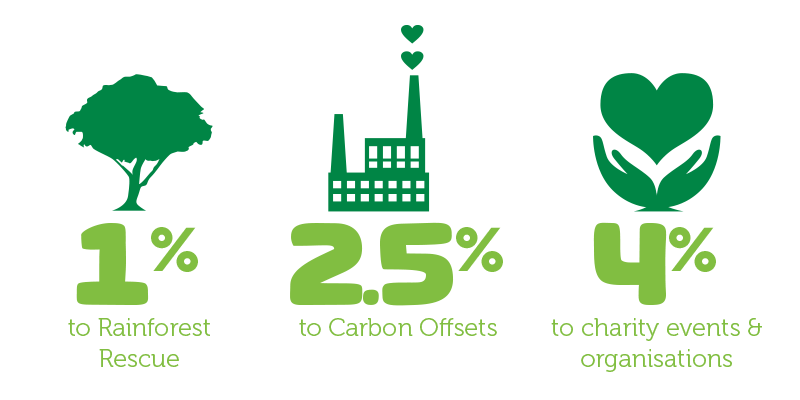 We offset all the carbon emissions associated with our products through the Carbon Reduction Institute. We are currently contributing to the Hanuman Argo Carbon Offset Project – it’s a biomass fired renewable energy project in India. BioPak makes the ordinary extraordinary by offering the humble paper cup as a canvas to promote talented New Zealand and Australian artists and connect consumers to the environment. New artwork on our 8, 12 and 16oz single wall cups every three months. Buying these Indigenous BioCups will directly help CorporateConnect.AB support Indigenous communities by developing practical, innovative, sustainable and strategic solutions for employment and economic advancement. Available in 8 & 12oz double wall cups. Kate, Sim and their 10 year old son William do a homeless food truck run every Tuesday night in Perth. They saw an opportunity to make a difference and they distribute donated food, toiletries along with their TLC, laughter and hugs.